L I V I A: [READY FOR UNSTOPPABLE VOLUME...?] RIMMEL LONDON RELEASES NEW SCANDALEYES RELOADED MASCARA + NEW, IMPROVED SCANDALEYES EYELINERS! [READY FOR UNSTOPPABLE VOLUME...?] RIMMEL LONDON RELEASES NEW SCANDALEYES RELOADED MASCARA + NEW, IMPROVED SCANDALEYES EYELINERS! Rimmel London recently welcomed Cara Delevingne as their new brand ambassador. She's the perfect role model for the brand as she represents the city's edgy, cosmopolitan beauty styles. And to launch the new SCANDALEYES RELOADED range, we see their new SCANDALEYES Reloaded Mascara, Extreme Volume, Extreme Wear (with up to 24 hours of impact), being launched in the beauty market. The new mascara looks to deliver extreme and bold looking lashes designed to make an impact. The formula is clump-free and is also made to be long-wearing of up to 24 hours. There's now a long-lasting formula for which I really like about this new mascara which means I can enjoy bolder and dramatic lashes for longer. The mascara also looks to deliver sweat-proof, smudge-proof and humidity proof - which means that it's so appropriate for any seasons of the year, whether it be Spring, Winter, Autumn or Summer. Furthermore, in terms of removing the mascara off the eye-lashes, it now made so much easier as you only need warm water. Of course, should you be wanting to use eye-makeup removal for that "extra clean" then by all means go for it. This mascara so ideal for me as the first thing I always look to do when it comes to cleaning off my make-up is to tackle the mascara off my lashes first. The formula also includes their First to Market Patented Technology Extreme Wear formula that looks to build on extreme volume for the lashes faster. The new hold on the mascara brush works faster and easier when it comes to coating the lashes. There's also no clumping to using the mascara which is great when you're looking for a formula that is consistent all way through. With the mascara brush, it features a tapered style design that looks to fit the shape of the eye, making it easier for you to coat each individual lash. Also, Rimmel London have released their new and improved ScandalEyes Thick & Thin Liner and ScandalEyes Precision Micro Eye Liner. These liners have two different options, with one being a thick and thin liner, allowing you for better optimal control on the style of liner you wish to create. The other Micro Eye Liner allows you to better control the cat-eye flick styles. What I've found out about these amazing liners is that they are very long-lasting and consist of an ultra-black colour that lasts for up to 24 hours. The formula is waterproof and smudgeproof too which is ideal for Summer and Spring when the temperatures will set to soar for those in Australia. Available now at Priceline, Chemist Warehouse, Target, Kmart, Big W, selected pharmacies and at selected Coles and Woolworths. Overall, I am loving the new ScandalEyes Reloaded Mascara along with their new and improved eye liners which lasts longer for the eyes. Now you can look to have long-lasting make-up for the entire day without worrying about touching up every few hours. 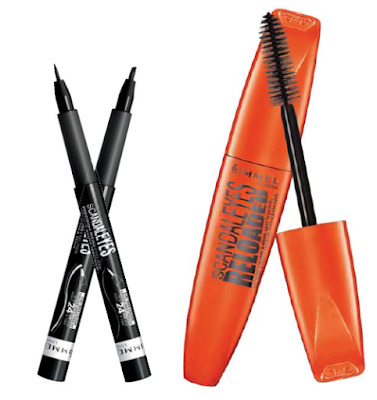 Have you guys tried out the new range by Rimmel London?